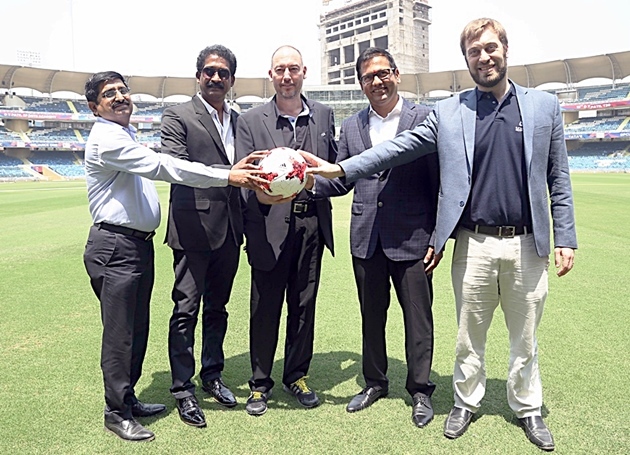 A FIFA delegation accompanied by members of the LOC visited the DY Patil Stadium to assess the progress of preparations at the Navi Mumbai venue for the FIFA U-17 World Cup India 2017. FIFA Head of Events Jaime Yarza expressed his satisfaction with the progression of preparation at the venue and said, “We are very impressed by the stadium here – the efforts put in by Dr. Vijay Patil and his team are exemplary and that will show when the World Cup happens here in less than 200 days time”. “We are sure that all the people from Maharashtra will be very proud about DY Patil hosting the World Cup and will come down in numbers to watch all the matches. We’re also appreciative of Navi Mumbai Sports Association as their training ground is practically completed and will be among the best ones in the country, and we are thankful of the Navi Mumbai Municipal Corporation, as they will develop the Yashwantrao Chavan Maidan ground to be the fourth training site in the city,” he added. Dr Vijay Patil, president of D.Y. Patil Sports Academy expressed his delight at the progress of preparations at the venue and exuded, “We are very excited to host the tournament and the recognition from FIFA is very encouraging. It’s an honour for us at D.Y. Patil group to showcase to the world our facilities as well as our affinity towards the beautiful game. In fact, I am certain that we will manage to fill in the stadium on each of the match days here”. Also present at the press conference were Henry Menezes, CEO of the Western India Football Association (WIFA) and Ankush Chavan, Additional Commissioner, NMMC.